Asteroid Day is a United Nations sanctioned event world-wide that had its start in 2014 with the help of Rock and Roll Hall of Fame guitarist Brian May of the British group Queen. Guitarist May, 69, is an astrophysicist with a PhD from Imperial College, London, completed during 30 years of studying the dust in our Solar System we can see as zodiacal light. Three years ago, he and a filmmaker got more than 200 scientists, astronauts, writers and artists to sign a declaration to the U.N. establishing a day to acknowledge mankind’s precarious position that one day we will be smacked by a disastrous space rock that might wipe out humanity. After all, that’s what happened to dinosaurs about 65 million years ago, ending their approximate 100-million-year reign of Earth. Rocker May and filmmaker Grigorij Richters chose June 30th for the international awareness of Asteroid Day because that is the day the civilized cities of Earth literally dodged a bullet. On the morning of June 30th, 1908, an interstellar chunk of rock or comet exploded over the Tunguska River region of Siberia, leveling forests for 770 square miles and creating a shockwave heard around the world. Had the Tunguska object exploded over the skies of London or New York City, they would have been leveled to rubble killing millions. Instead, the only fatalities were animal life, and the explosion was so remote in Siberia that it took 20 years for researchers to travel to Tunguska and see the incredible devastation. The culprit of Tunguska has never been found as it exploded above ground before impact, leaving no fragments in the ground. Astrophysists believe it was a small comet, maybe 10 miles across. Today, astronomers track everyday more than 1,800 potentially hazardous asteroids that might hit Earth one day, ranging in size from 60 to 16 miles. And several times a year we are finding smaller space rocks—sometimes just the size of a football field—that speed by only as far as our Moon, 240,000 miles away. Space rocks are slamming into other Solar System bodies all the time. Just look at our cratered Moon, and the planets Mercury and Mars. And there are dozens of other moons in the Solar System that show the scars of interplanetary impacts large and small. To prepare for the risk of catastrophe, NASA has developed a Planetary Defense Coordination Office. Other space agencies have developed similar programs. On NASA’s Planetary Defense FAQ, the agency writes that deflecting an asteroid would require changing its velocity by less than an inch per second years in advance of a potential collision. NASA is working to develop a so-called kinetic impactor, which would hit an asteroid slightly with an object to slow it, and a gravity tractor, which would put a large mass near an asteroid whose gravity would tug at it enough to change its path. On Earth, the erosion of wind and rain has leveled and filled up most meteor craters. One huge exception is the Barringer Meteor Crater in Northern Arizona, a bucket list visitation site for many stargazers. The meteor that made that one-mile scar in the desert landscape was 160 feet wide and smacked Earth around 50,000 years ago with the power of 10 megatons of dynamite—3,000 times the destructive power of the nuclear bomb dropped on Japan in World War II. And a large asteroid impact will happen again. It’s not a case of if, it is an unpredictable when. More than 10,000 tons, yes, tons, of cosmic debris land filter down to Earth each day as meteoroids burn up in our atmosphere as meteors. If they make it to the ground, they are meteorites. Some asteroids are leftovers of the Solar System’s creation, but many are chunks of other bodies that were ejected into space by impacts on our Moon, Mars and other solid bodies like the large collection of asteroid rubble between Mars and Jupiter. You can even buy a piece of the Moon and Mars that are confirmed meteorites that have fallen to Earth! 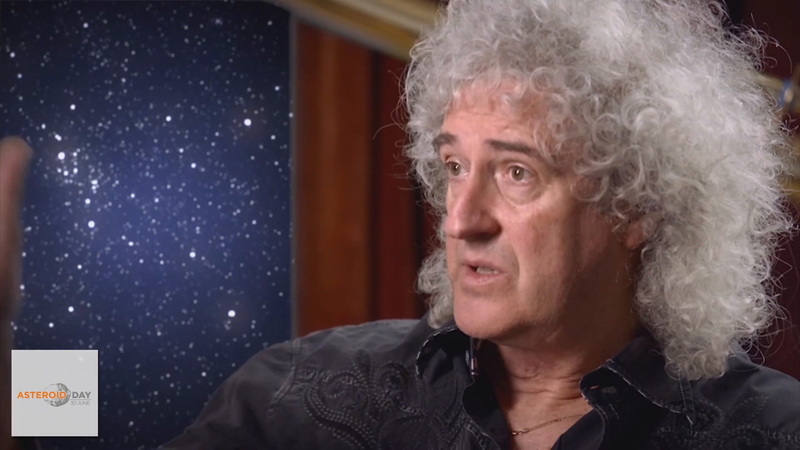 To that awareness, Brian May wrote the music for Richters’ film, titled “51 Degrees North,” a fictional story of an asteroid impact on London and the resulting human condition. May is co-author, with Sir Patrick Moore and Chris Lintott, of Bang! – The Complete History of the Universe, 2006, and authored The Cosmic Tourist, 2012. Asteroid 52665 Brianmay was named in his honor. There is a B612 Foundation, an American-based non-profit advocacy organization created to protect the world from dangerous asteroids through early detection. B612 co-founders Apollo 9 Astronaut Rusty Schweickart and three-time Astronaut Dr. Ed Lu, along with Danica Remy, brought to Asteroid Day a network of planetary defense specialists and global contacts. Employ available technology to detect and track Near-Earth Asteroids that threaten human populations via governments and private and philanthropic organizations. A rapid hundred-fold acceleration of the discovery and tracking of Near-Earth Asteroids to 100,000 per year before 2024. Global adoption of Asteroid Day, heightening awareness of the asteroid hazard and our efforts to prevent impacts, on June 30. Space is a dangerous place to be, and since the Earth is in space, every living thing on the planet is at risk of eventually feeling its wrath. Asteroids are the most clear and present threat that our Solar System poses to us, and you only need to look at the scars on the Earth, our moon, and other planets in our neighborhood to see exactly how real that danger is. Now, a Queen’s University Belfast researcher is warning that the Earth is definitely going to be hit, it’s just a matter of when. The expert, Alan Fitzsimmons, points out that an event similar to that of the 1908 meteoroid explosion over the Tunguska region in Russia’s Siberia — which leveled a forest and damaged buildings but didn’t result in any human deaths — could happen again, and if it did happen over a major city, the results would be devastating. It’s a fitting warning as we approach June 30th, which is observed as Astroid Day. On June 30th, researchers and former astronauts will host a live stream to answer questions from the general public which are sourced from social media. You can bet there will be plenty of talk about the potential for collisions with near-Earth objects, so if such a thing interests you, it’s a great time to get the facts straight from the experts.